Although Pizza Hut is not paying me for this, I have decided to try all the flavors from their new Tuscani line of pizzas. After the Supremo which my dad loves, the Roast Beef which we felt so-so, and the 3-Cheese Bacon and Spinach which was my favorite, we ordered something again from their Tuscani line. 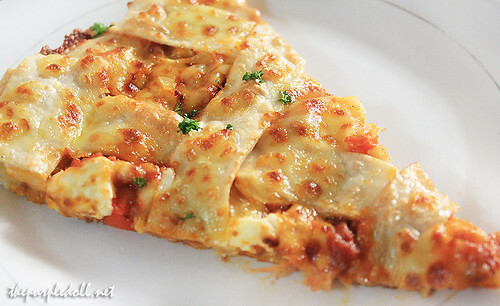 This time though, we had Pizza Hut's new festive flavor for Christmas, the 4-Cheese Lasagna Pizza (P549). I loved the 3-Cheese Bacon and Spinach for being so cheesy, so I was excited that this flavor has 4 types of cheeses -- Parmesan, mozzarella, cheddar and cream cheese. The cheesiness level was so satisfying! Beneath the layer and blobs of cheese, this pizza is actually a lasagna, complete with flat pasta, bits of meat, herbs and a tomato-based sauce. I asked my dad what he thought of this pizza. He did not dislike it I think, 'cause he only said the flavor was too rich for a single slice. My little sister on the other hand, enjoyed her slice of the pizza since she loves Pizza Hut's Lasagna Classico anyway. However, she said that it was a little messy to eat this pizza especially when you've pulled out the top layer already. I'm not sure if many will dig this pizza flavor. However, I personally like it (though not as much as the 3-Cheese Bacon and Spinach) as a slice or 2 is already filling and oozing with cheesy goodness. It's as if ordering a lasagna dish and a cheese pizza and eating them both at once. Now, only Premium All Meat, and Gourmet BBQ Chicken flavors are left to be tried. How about you, have you tried any flavors from Pizza Hut's Tuscani line? What do you think of combining 4-cheese and lasagna in a pizza? wala pa ko nttry haha! Maybe soon :) D always craves for Shakeys kasi e..
Oh my! This is truly Carbo-loading. Pasta on bread layered with cheese ^_^ Heaven! wow we we're about to try pizza hut's 3-Cheese Bacon and Spinach but changed our mind and ate home cooked meal lolz... i'm so excited to try these flavor thanks for this mouthwatering pix and desc! wala pa rin ko natry, nag pizza hut din kami last week, and same pa rin order. hehe! Di ko pa natitikman ang Tuscani line nila. Na cu curious ako sa 3 cheese bacon and spinach! I'll definitely try that first. @A: As much as I hate to admit it, they all went straight to my tummy and thighs.. :)) It's really fun to eat a lot, yet so hard to take off all the weight. that looks yummy! looks like i've been missing a lot. can't wait for the vacation to come!!!! Your pics always look professional. I haven't tried any of them yet, hoping to try them the soonest!! since I don't cook, we always order pizza at home. i haven't tried their tuscani line, though. i always go for the safe yet yummy super supreme pizza. 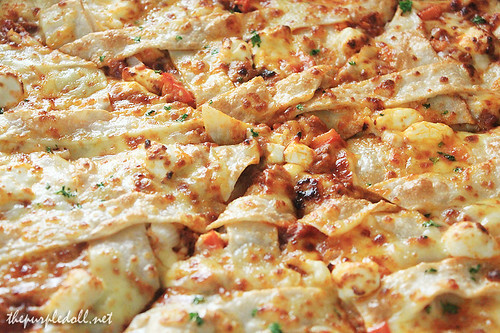 :) i'm not sure about the lasagna-pizza but maybe i'll give it a try soon. i literally got hungry when i saw the photo above! The picture looks yummy but I don't think I'll try it. Hahaha. You know, during 2 years that we lived in GA Tower in Boni where there is a small Pizza Hut store at the ground floor, we ate pizza like 3 times a week. It was really bad because they sold it buy one take one and we couldn't finish one family pizza in one sitting. So imagine, you eat pizza that night and then you have to eat it again the next day and luckily, again the next day. Yay, kaumay! I threw my palm card after expiration huh!! Currently, I like Shakey's super thin pizza. And of course, my favorite of all time Sbarro's! Lasagna pizza is back????? OMG. I love it!!! But is this the same lasagna pizza they have before? Ma taste test nga ito mamaya. Thanks sis!! oMG! i have to try this one! thank u for this post! So yummy... can I have one slice please??? It would be perfect to much it with Coke this Christmas. Ok now THIS looks good. Maybe not if you're expecting an actual full-on pizza taste...but I LOVE lasagna so I think I'd really enjoy this one. Btw, even if they're not paying you, Pizza Hut should hook you up with some free pizzas or something!! The Purple Doll's Christmas Giveaway!